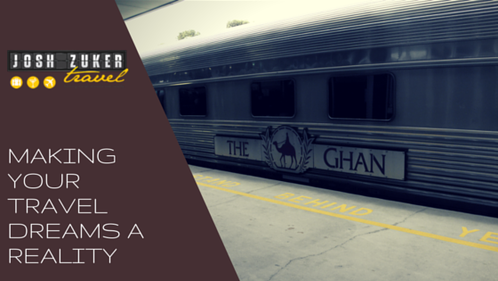 It is always Josh’s aim to make your travel dreams a reality and for Sue and Dale travelling across the Ghan was just that! We were so impressed to hear that their travels went well that we wanted to share their experience with you. The excitement at the terminal in Adelaide was such an experience, as we waited, taking photos of the train, working out how many carriages and meeting other passengers as we all await the call to board for “Our Journey”. We order our first drink at the Club Car, sit back in the comfortable seats next to the window and take in all the sights we can. We talked to a vast number of people who have travelled extensively before and listening to their adventures was wonderful. The food was top restaurant quality and always had a choice with each course. Delicious, perfect presentation and staff that were extremely friendly and efficient. Each meal time you are likely to be sitting with someone different as they fill up the table. More chit chat, new people and another enjoyable mealtime. Watching the sunrise in the outback is certainly spectacular and definitely a highlight during the trip. Nitmiluk Gorge (Katherine Gorge) and how it is truly a great splendour of our country. Home to many freshwater crocodiles and tree life in areas almost unimaginable really was worth every second on the boat with the wonderful informative ranger guiding us up the gorge and back. Travelling on, the countryside does change a lot between the types of plants and shrubs you see, the colour of the earth and keeping an eye out for the different types of animal life that you see. When there is something of significance approaching, the train staff inform you over the speaker system what is ahead and on which side of the train. They also provide the history behind it as you approach. It truly was an amazing train journey – lots of laughs, great company, magnificent photos and some new friends. An experience not to be missed. We would do it all again tomorrow. Call Josh now to make your travel dreams a reality on 1300 761 901.